A good post. We all need reminders. More than a little, I think! That was lovely. And I do remember . . .
You are preaching to the choir brother! I was a tot when my (biologic) parents did that Green Stamp thing, so yes I remember them. My mother pouring over the catalog they put out and drooling a little bit. Going to the actual green stamp store (because they had physical stores in them days) and how it smelled kinda strange in there… probably the glue. And yes, again I have mist in my eyes. You still got that mega box of Kleenex I warned you to stock up on? *sniff* I believe you do ! We called the quality stamps and had a quality stamp store over on Old summer road in Memphis. Most of the small appliances, dishes and linens for our first home was directly from that store and yes, we had the Jarts too. First: I must express my admiration for the new direction your Village series is taking (or at least is at the moment). It’s both creative and brimming with possibilities. 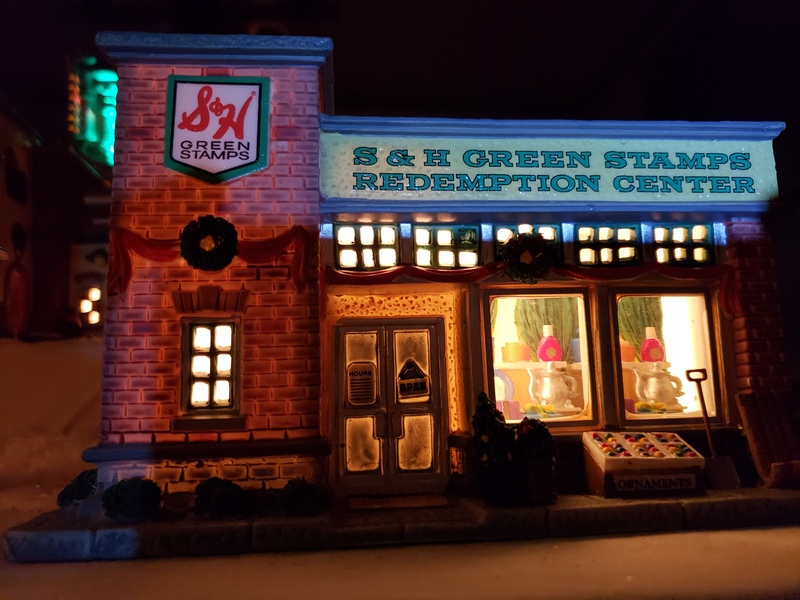 Second: YOU HAVE AN S & H REDEMPTION CENTER?!! Geez man, no wonder you were so hell-bent on acquiring this set! It all makes sense now.